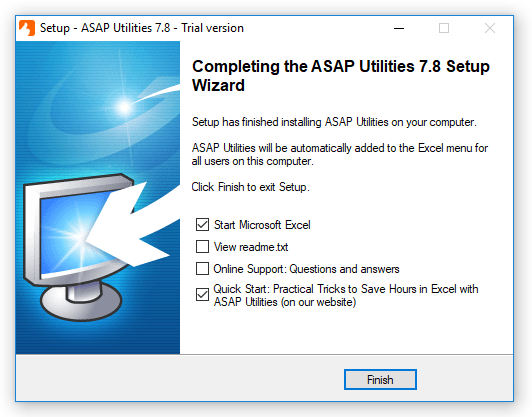 Installation is as easy as to follow the steps presented to you when you run the ASAP Utilities setup. 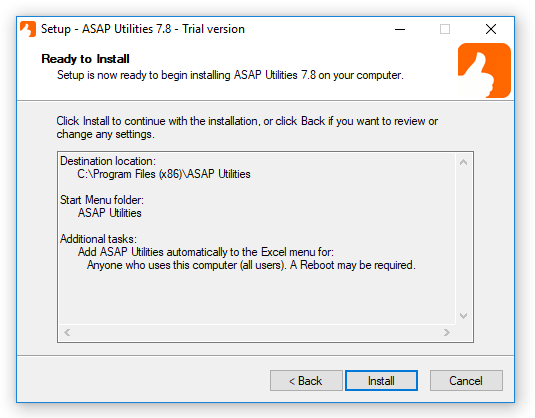 The setup does not require your computer to restart at the end of the installation, you can immediately start using ASAP Utilities in Excel. 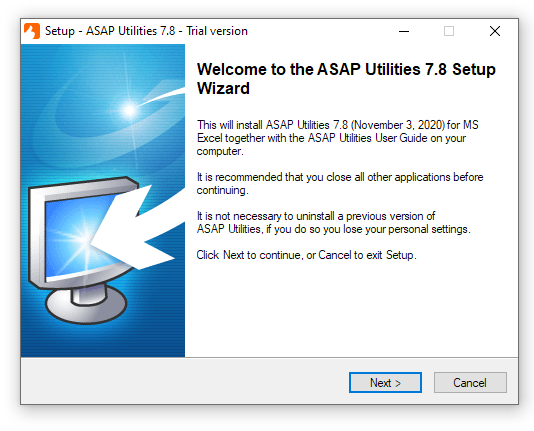 To install ASAP Utilities, follow the steps presented to you when you run the ASAP Utilities setup. The installation is even more detailed described in the User Guide (PDF). Just like with most programs it is recommended that all programs currently running on your computer are closed before you run the setup. You must either be allowed to install software on your computer or use the non-admin single user setup of the Business edition (version 7.3+). When you upgrade, just run the setup of the new version. 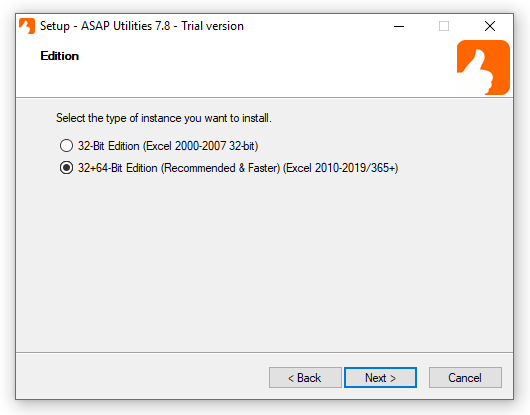 It is not recommended to uninstall a previous version of ASAP Utilities. If you do so all settings will be reset to the default settings, such as your favorite tools menu and your license details. 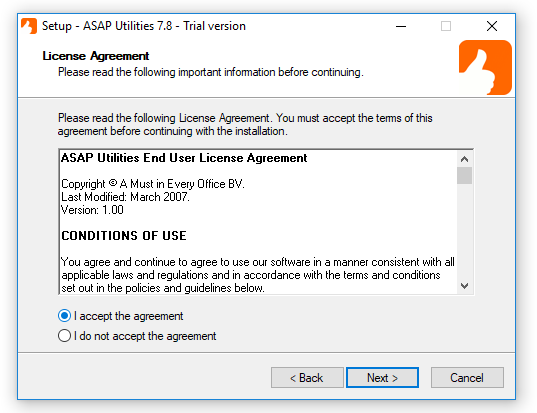 The ASAP Utilities setup and add-in files are signed with a digital certificate. This signature provides you with the assurance that, what you are about to use, comes from our company and that it has not been tampered with. 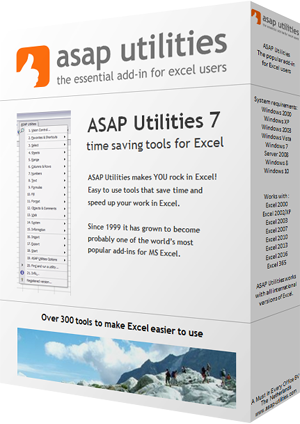 Download the ASAP Utilities Setup and run it. 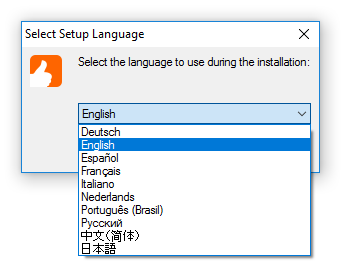 Select the language to use during the installation and choose OK. The installation wizard begins and the welcome dialog is displayed. Click on the Next-button to continue. 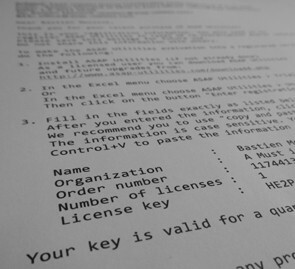 The License Agreement dialog is displayed. Please take time to read the license agreement. If you agree choose "I accept the agreement" and then click on the Next-button. If you disagree with the license terms, choose "I do not accept the agreement". If you do not accept the agreement the installation will be canceled. An information dialog is displayed. Click the Next-button to continue. Select a folder to install ASAP Utilities. We recommend you use the default folder, "C:\Program Files (x86)\ASAP Utilities" or "C:\Program Files\ASAP Utilities\" but any other location can be used too. ASAP Utilities requires approximately 23 MB of disk space. 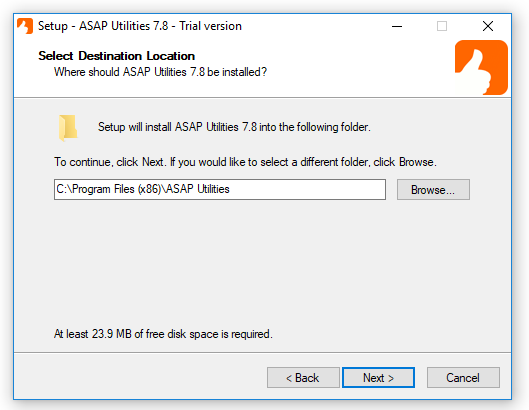 If you have a previous version of ASAP Utilities installed and are upgrading, then the setup will automatically detect the previously used destination folder. Click the Next-button to continue. 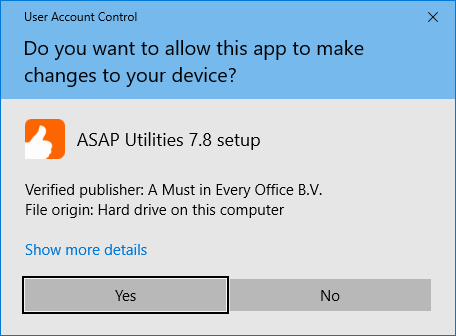 If you want to, then ASAP Utilities can create an entry in your start menu with for example quick access to the PDF User Guide. 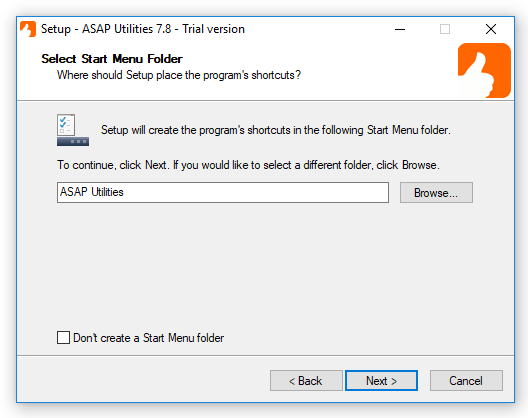 If you want the ASAP Utilities menu to be automatically added in Excel for all users on this computer choose "Anyone who uses this computer (all users). A Reboot may be required". Click the Next-button to continue. 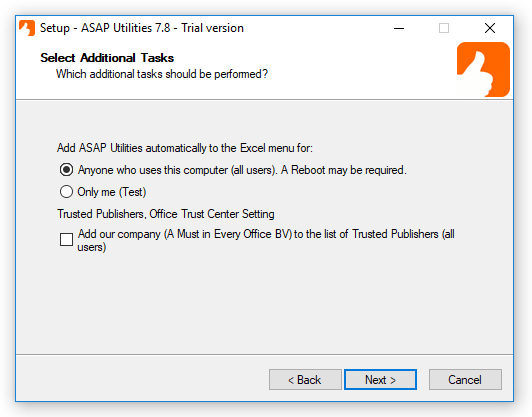 This will automatically add ASAP Utilities to the Excel menu for each user that logs in on the computer. This is also handy when you log in with normal user-rights and run the setup as an administrator. At the end of the setup, we'll show how to manually add ASAP Utilities to the Excel menu if needed (step 10). Click "install" to install the files to the selected folder. The setup program now installs the files on your computer. The Setup is completed. Click the finish button. 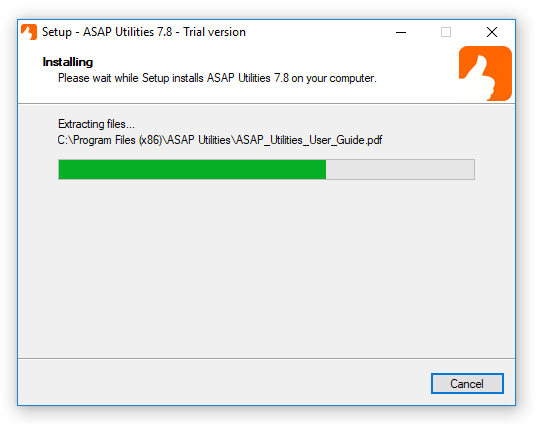 The installation is finished and you are ready to start using ASAP Utilities. To turn your trial into the full unlimited version, follow step 12. 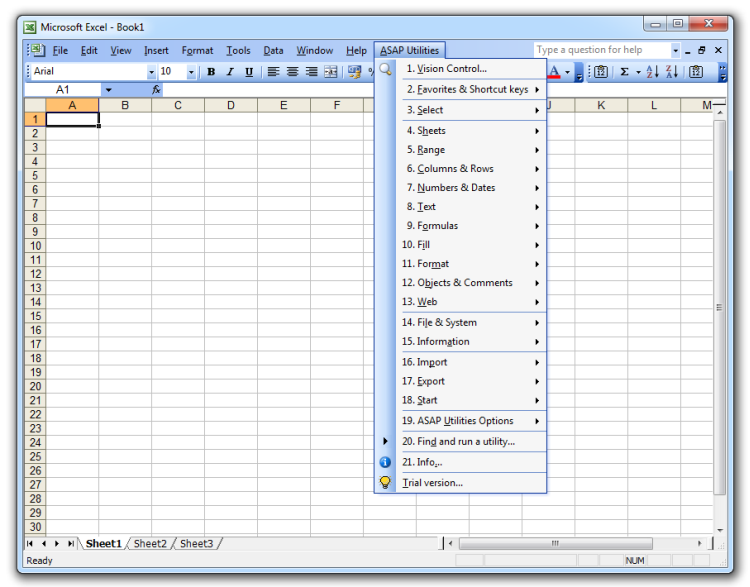 In the Excel menu you will find a new item called "ASAP Utilities". Note: If you are temporary logged with an admin account to run the setup, then please now log in as the end-user before you enter the license details, because the license is stored per user-account, not per computer. 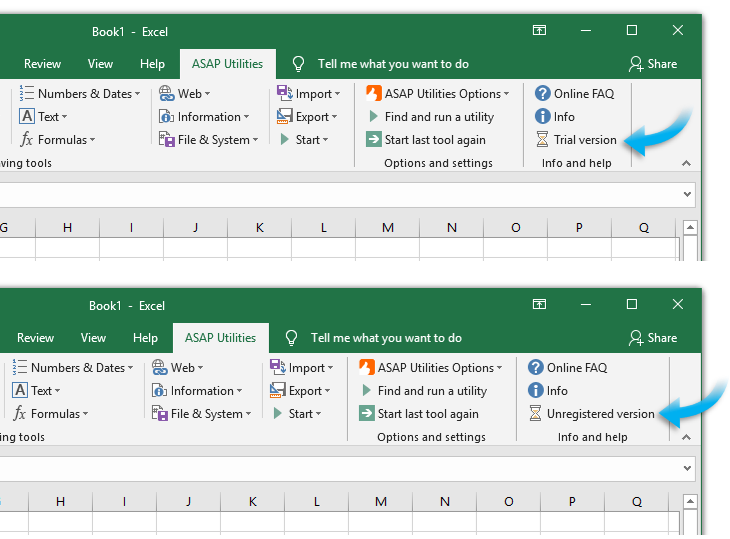 In the Excel menu choose "ASAP Utilities" > "Trial version"
In the Excel menu choose "ASAP Utilities" > "Unregistered version" and then click on the button "Enter registration information"
Fill in all the fields exactly the same as in the email with your full license details. You received two emails after the order was completed. 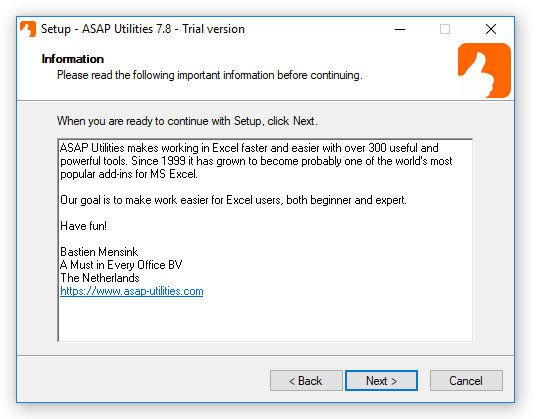 The email from "ASAP Utilities (A Must in Every Office BV)" contains the full license information. After you entered the information click on the "Register" button. We recommend you to use "copy and paste" to avoid typing errors. The information is case sensitive. You can use the shortcut Control+V to paste the information in the fields. 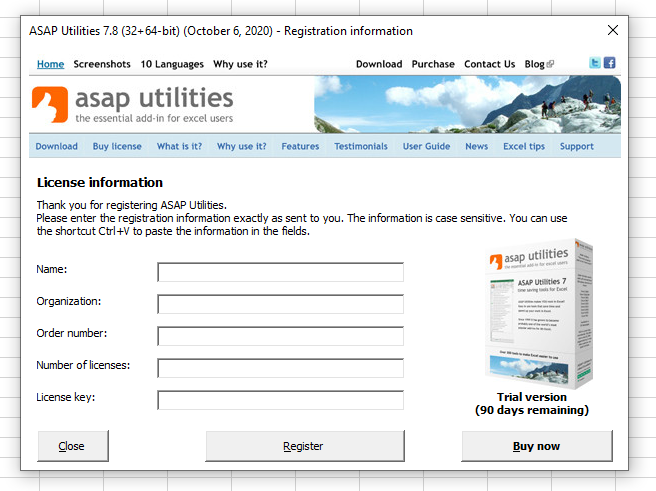 How do I enter my ASAP Utilities registration code? You can find more answered questions in our support section.